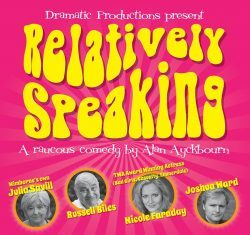 RELATIVELY Speaking is the seventh play that Alan Ayckbourn wrote, some 52 years ago, and although it was his second West End transfer, this was the one that made him an overnight success as soon as the reviews were published. The play is very cleverly constructed, with economy of language to help introduce confusion, but it has a simple structure, and a simple plot, all of which makes the situation funnier and more awkward as identities are confused and ambitions thwarted. This is the third Ayckbourn I have seen by this company, with two different directors and some of the same cast. From the many of his plays that I have seen, been in or directed, I agree with the playwright that the secret of his plays is to play them for truth, and reality, in as natural a style as possible. Sadly many professional companies play it too much for laughs, something I find very dated, and which misses so much of the subtlety and pathos of the characters and the script. Dramatic Productions, however, get it exactly right: their characters are always played as real people, meaning that we share their joys, their despair, and their suffering. Young couple Ginny and Greg have only been together a month, but before she can accept his marriage proposal she must stop the contact from her former, married, lover Phillip, so she goes to visit him, telling Greg she is off to her parents. He finds the address and follows her. That is all I need to write about the plot: suffice to say that complete confusion ensues, as Greg has not met Phillip, and neither Greg nor Ginny have met Phillip’s wife Sheila. Nicole Faraday and Joshua Ward are Ginny and Greg, Julia Savill and Russell Biles are Sheila and Phillip, each one of these know exactly how to bring the best out of this play, and all four of the characters become real people in their hands, tightly directed and kept just the right side of slipping from frustrated character into farcical caricature by Tracy Murrey. We squirm as Greg treats Sheila and Phillip as Ginny’s parents, we laugh as Phillip thinks he knows what is happening, and we share the delight as Sheila finally realises what her husband has been up to and takes revenge. We laugh at the mistakes, the confusion, the improbability, but we do not laugh at the characters, we care about them because they are so believable. This is honest and natural acting, indeed Ayckbourn should be delighted to know that his work is as safe in the hands of this company as his own, and I for one look forward to the next of his works that they choose to present. Posted in Reviews on 11 August, 2017 .